Act Now Against Cipro! The FDA is Ready! Posted on May 2, 2015	by Angela A Stanton, Ph.D.
Cipro is only one killer of many in the fuoroquinolone class antibiotics! As some of you may know, I have filed at the FDA a Citizen’s Petition again the antibiotic drug class fluoroquinolones, the most frequently prescribed antibiotics today. I started my attack with Cipro as guilty #1 since that is what nearly everyone gets and the number of people getting sick from Cipro is staggering. Cipro is now also understood to be the cause of the Gulf War Syndrome since soldiers were mandated to take it every day against anthrax in the field. Many people have been permanently injured–some even have committed suicide. I am a firm believer that fibromyalgia is yet one more of the diseases we may be able to point to this class of drugs. The citizen petition docket is still open. I just received a letter from the FDA stating that the matter is so complex that they have not yet been able to make a decision–please see below. Thank you on behalf of all who suffer and those who committed suicide! This entry was posted in Big Pharma, FDA, Fibromyalgia, Healthcare, Must Read, This & That, Thoughts and tagged act now, Cipro, citizen petition, comment, docket, FDA, fluoroquinolone, fluoroquinolones. Bookmark the permalink. 14 Responses to Act Now Against Cipro! The FDA is Ready! Pingback: Fluoroquinolones & Aneurysm the FDA Warns | Clueless Doctors fail to keep up with the latest science. Pingback: FDA ruling on Quinolones! FINALLY!!! | Cluelessdoctors fail to keep up with the latest science. Thank you for your work. I’m another one who’s had my life completely & utterly destroyed by Cipro. I’ve been housebound and more or less confined to living in bed for nearly six years now as a result of just twelve pills. Most people think death is the worst side effect a Rx drug can carry…they’d be wrong. I WISH it had killed me. Everything I ever had that constituted a life is gone anyway. 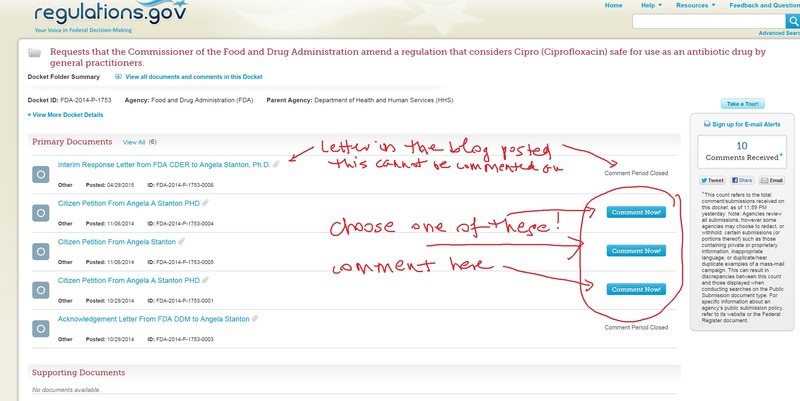 When I went to the site to add a comment to the FDA letter it said period closed. I will not try to tell my long and painful journey post Cipro. I just need you to know no one should have to go through hell because of a drug given them for a simple sinus infection. My doctor could have chosen any number of safer options but instead used a nuclear bomb. Sinus infection gone……..life as I knew it also gone. Please stop hurting people you are supposed to help! Agree Gary but doctors don’t know!!! The FDA comes out with regulations and then has no power to enforce so the drugs must be pulled off the market for doctors to notice! 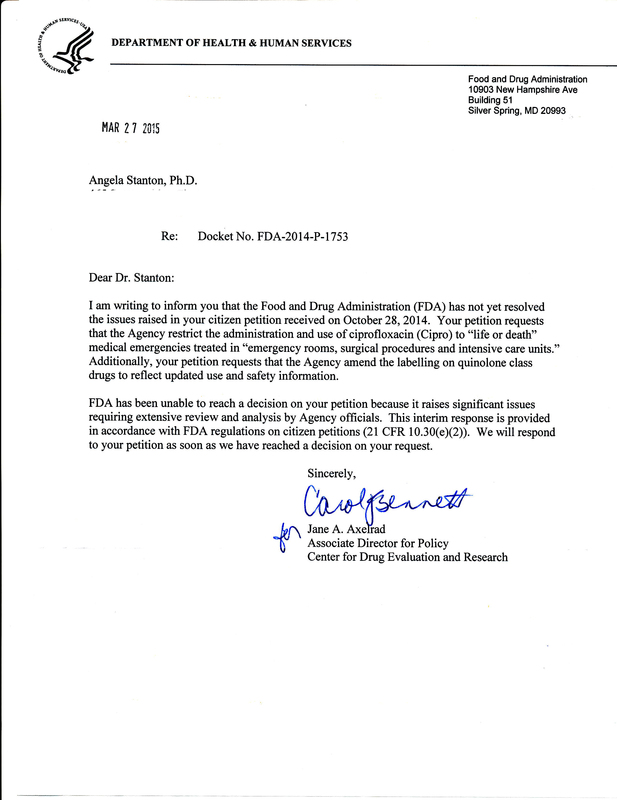 I asked FDA and just about fainted from that response. Take Aspirin, for example. It was proven that it is not suitable for a first line defense against heart attacks or strokes and can in fact cause GI issues. Bayer appealed and FDA turned them down so they are NOT ALLOWED to recommend it as first line prevention! Yet I see TV commercials continue on using Aspirin as first line prevention every day! I asked FDA about that. They said they had no power of enforcement. So who does??? We do! I suppose the only way to get Bayer from pushing it and doctors from recommending it is by removing it from the market! Aspirin is not at that stage yet but Cipro and the rest of quinolones are. Until they get to be removed, doctors will be clueless and they will continue to prescribe! So if you want to help and have Cipro and the rest removed from the market, this is your time to act! Please visit the website at the link, press “comment now” on on one of the buttons attached to my application that is posted 3 times for some reason. It will take you 5 minutes to put in your comment and may help removing this drug from the market. It will not disappear from the market if people complain here but not THERE!!! Please put in a complain at the FDA!! The link is in the article!